This recipe for French toast sticks is a super easy preparation, and they're an excellent way to get kids to eat their breakfast. This recipe makes enough for 2 to 3 servings. Double or triple the ingredient amounts for a large family or, if you like to make meals ahead, for the freezer. 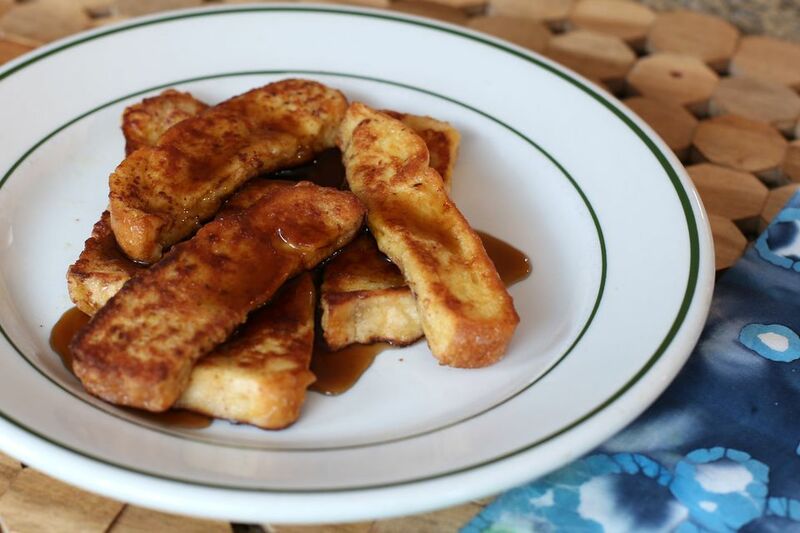 Make the French toast sticks on the weekend, freeze them in small food storage bags, and then heat them in the microwave oven, toaster, or skillet when you need them. In a medium bowl, whisk together the eggs, milk, and vanilla. Cut each slice of bread into four strips. Dip the bread strips in the bowl to soak briefly. When the butter is hot, add a batch of soaked bread strips to the skillet and cook until golden brown, turning to brown both sides. Sprinkle with a little confectioners' sugar or a sugar and cinnamon blend and serve with butter and maple syrup. Or top with a simple maple butter or powdered sugar. Soaking time depends on the bread you're using. A typical loaf bread will fall apart if soaked too long, so don't let it stand in the egg mixture. A denser bread, like brioche or challah, will soak up the egg mixture and hold up nicely. Texas toast is another good, sturdy bread. If you find you have trouble with burning butter, try vegetable oil or a combination of half butter and half vegetable oil. For sweeter French toast, add a teaspoon or two of sugar to the egg batter. The darkest maple syrup will give you the most flavor, or use golden cane syrup or fruity syrup. Make extra and freeze it for another morning. Heat frozen French toast in the microwave for 30 to 45 seconds or pop it in the toaster. For larger amounts, bake pieces in a single layer in a preheated 375 F oven for 8 to 10 minutes.